In San Francisco’s historic Sunset District, there is a charming 1,289 square-foot 2-bedroom home, brimming with potential. That potential stems not from its character, but from its price tag: At $995,000, it is one of the few homes on the market in San Francisco for less than $1 million, and far below the city’s staggering median home price of $1.62 million. We’re nearly ten years removed from the 2008-09 mortgage crisis, and one symbol of the recovery is the broad rise in home prices across the country. But in the past year or so, some investors have grown concerned that another potential crisis is around the corner, citing data points such as the eye-popping prices in markets like San Francisco, as well as recent housing starts reports that suggest slowing growth in new construction. While these data points deserve attention, we believe that the broader array of data reveals a much healthier mortgage market than the one that existed before the 2008-09 crisis. While a housing pullback may be inevitable, the mortgage market is in much better shape, in our view, to weather it. Source: Mortgage Delinquency Rate: Federal Reserve Economic Data (FRED); Home Price Index: Brown Advisory calculation derived by subtracting the housing component of the Consumer Price Index from the S&P/Case-Shiller 20-City Composite Home Price Index. As shown in the chart above, delinquencies have fallen for eight straight years, reaching a cycle low of 3.7% in 2017, down from a peak of 10.9% in 2010. This metric still has a ways to go before it reaches the sub-2% level we last saw in 2005-2006, and there is fundamental room for improvement (legacy assets from the crisis era are still working through the foreclosure pipeline). Additionally, home prices are indeed lofty in the Bay Area and several other regions, but price trends vary widely regionally. National prices have surpassed their peak in 2006 on a nominal basis, but after adjusting for home-price inflation, current real prices are still 24% below that peak level (shown in Chart 1). 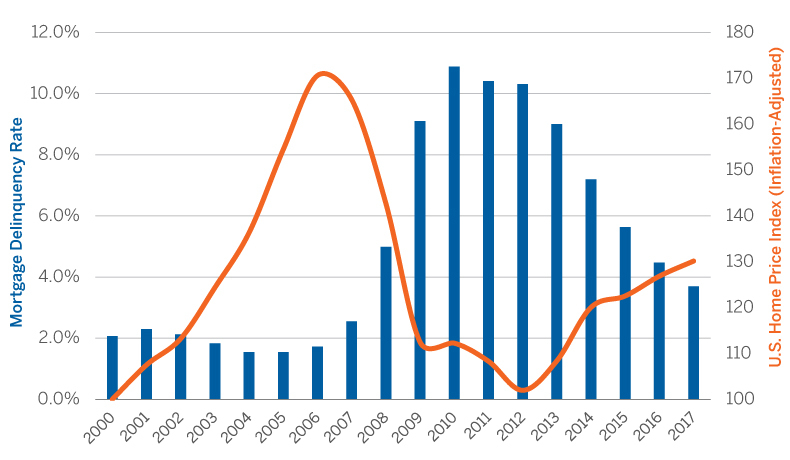 This chart highlights how much underwriting standards have tightened since the financial crisis. The quality mix of newly originated loans is much higher today relative to pre-crisis mortgages. In 2005, non-agency lending was a huge component of the lending market, but today, government-backed mortgages represent the vast majority of the market. 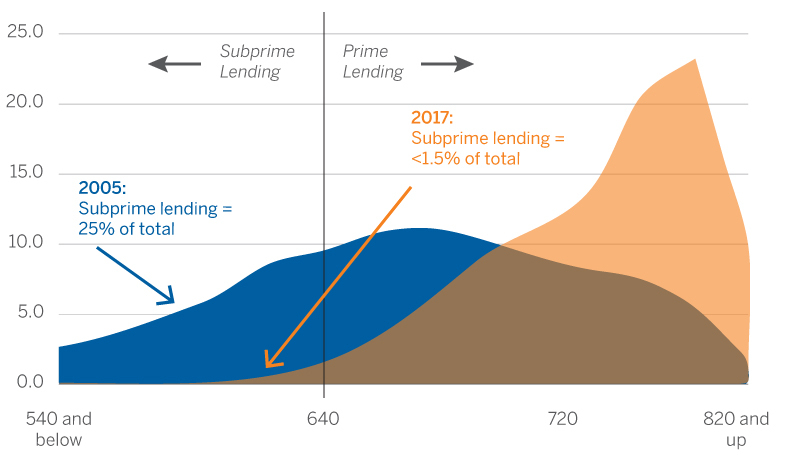 And, within that non-agency lending segment, loans to subprime borrowers make up less than 1.5% of total originations (using a credit score of 640 or lower as a cutoff metric for subprime). In contrast, in 2005 nearly 25% of non-agency borrowers had scores below 640. Simply put, subprime lending was the root of the mortgage crisis, and from a big-picture perspective, subprime lending makes up only a tiny sliver of today’s mortgage market. We understand the concerns some investors have expressed: For years, the central narrative supporting rising home prices was limited inventory and new construction that wasn’t keeping pace with demand. Recent data challenged that thesis. Below-consensus numbers for new housing starts and existing home sales in the past few months suggested to some that the supply crunch had dissipated. But it is dangerous to extrapolate big conclusions from single data points. The housing market is a product of a multitude of variables—existing home sales, inventory figures, construction spending, mortgage delinquencies and broad credit mix in the MBS market are just a few of many indicators that fixed income investors should consider when looking at the mortgage market. Housing prices may pull back eventually, and interest rates and other factors could impact mortgage pricing in the short term, but from a fundamental perspective, the mortgage market appears to us to be on solid ground.